"I have been using this method called 'cold brewing' during the hot summer months for years. I have not seen a recipe for it on this site so I figure it's time to let the secret out. Requires no coffee pot or fancy equipment either, gotta love simplicity at it's best. This makes the perfect cup of iced coffee. The heating of the beans is removed from this process, therefore it also removes the acidity from the coffee. Perfect for sensitive stomachs like mine! Enjoy. Stays fresh for about a week in the fridge. Add ice, simple syrup, or chocolate syrup for sweetness and a touch of cream and you will wonder (like I did) why I haven't heard of this miracle before!" 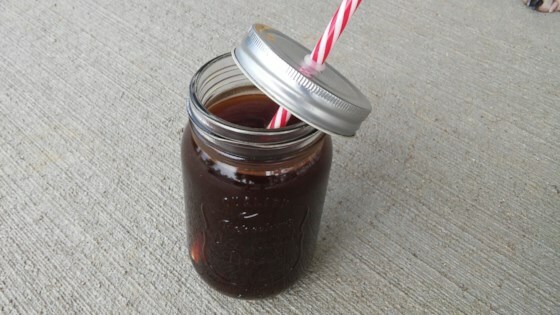 Mix water, coffee, vanilla extract, and cinnamon together in a jar or resealable container. Stir well. Let coffee stand (no refrigeration necessary) until flavors intensify, 8 hours to overnight. Strain coffee through cheesecloth into a separate container. Substitute vanilla extract and cinnamon with any flavorings you prefer. You can strain the coffee through a coffee filter or even paper towels if desired. Easy simple syrup: mix 1/2 cup sugar and 1/2 cup water in a microwave-safe bowl. Microwave until sugar melts, about 1 minute. First time I made cold brew coffee. Taste smoother than regular brewing with hot water but use much more coffee. I don't add vanilla or cinnamon. I've never tried cold brewing before, and I thought this turned out fine. The only thing is the ground cinnamon was a bit difficult to filter through, but it had a nice flavor.